Most people probably know that Japan is a country where shoes are removed at the door. While modern Japanese people usually step out with a typical assortment of contemporary footwear, in centuries past the shoes-on, shoes off problem was solved by zori and geta, traditional Japanese sandals for all occasions and seasons. Today these sandals are most popular at fireworks festivals and other traditional events, but one thing hasn’t changed: With a shape a bit like casual beachwear, they are still comfortable! 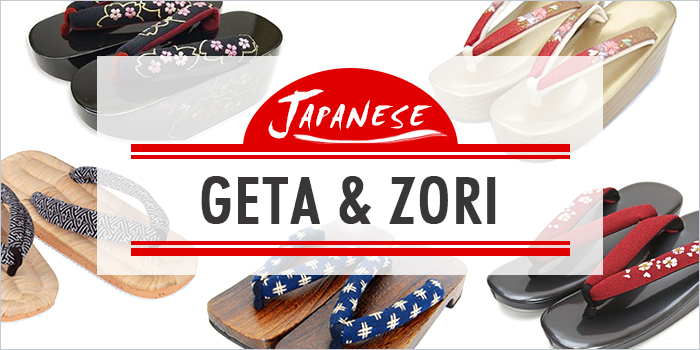 And unlike their thin rubber Western counterparts, zori and geta can be very beautiful as well as practical. 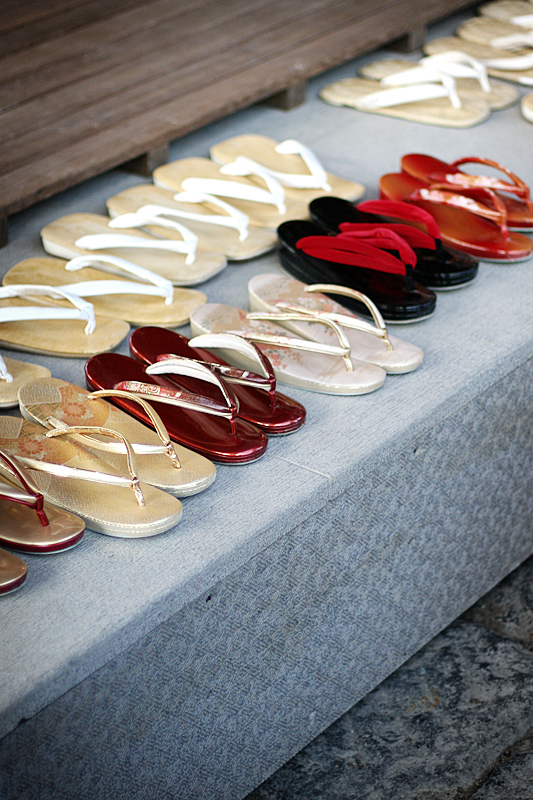 Make a fashion statement and beat the heat with Japan’s traditional flip-flops! 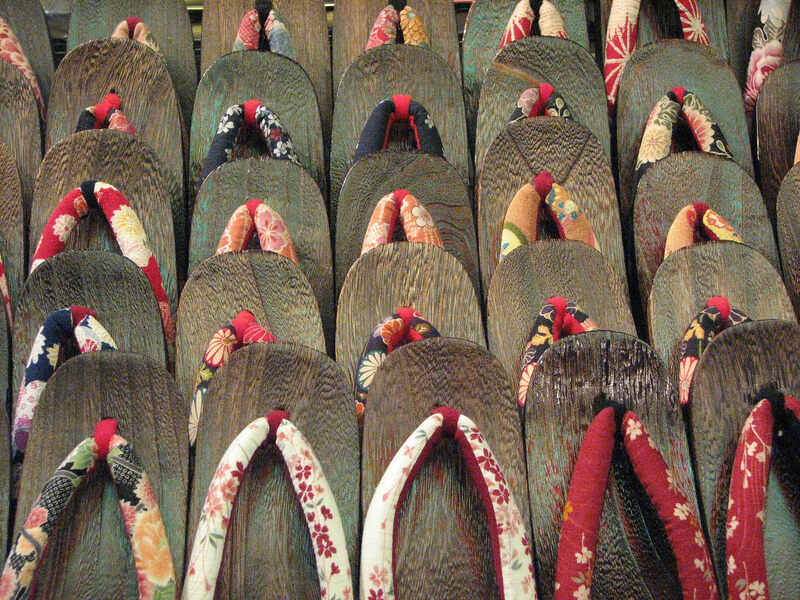 Traditional Japanese geta are wooden sandals that stand out mainly because of their “teeth”—the supporting pieces of wood attached to the sole of the sandal. While you might compare them to platform shoes of the ’70s, they weren’t originally designed for fashion. Rather, they give the wearer enough height to keep the lovely kimono from getting dragged in the mud or snow. Merchants and sushi chefs traditionally wore extremely high geta to keep some distance between them and the scraps on the floor. Sometimes these men even wore geta that had just a single tooth, called tengu-geta, positioned right in the center of the sole. 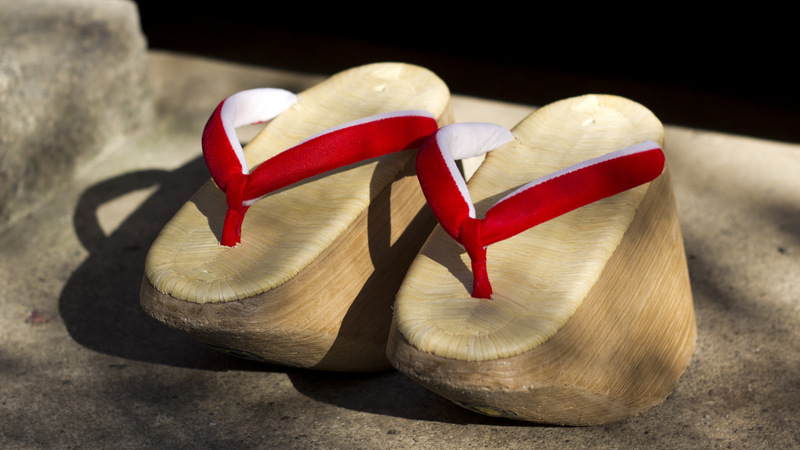 There are also special geta worn by geisha in training that are solid with the toe slanted at the front. 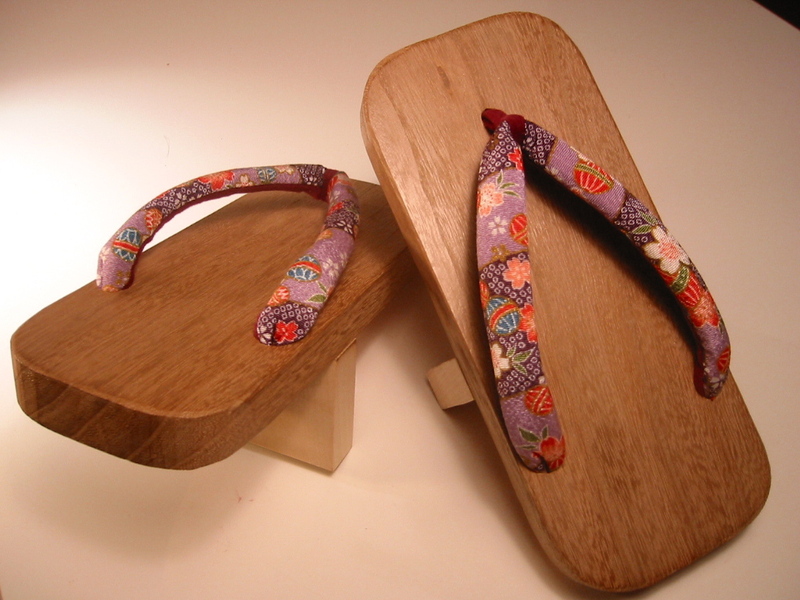 This type of geta is also sometimes worn by young girls during traditional celebrations. They are called pokkuri or koppori (say these words out loud a few times and you’ll realize they’re named after the sound the geta make as they clip-clop through the streets). Since most people are neither aspiring geisha nor sushi chefs, probably the most important thing to remember is that there are geta for every season! Ama-geta are specifically made for the rainy season and can be as high as 18 centimeters, and snow geta have the addition of metal plates attached to the base to prevent slipping. These wet weather geta often feature a little cover to keep your toes dry. Low geta, on the other hand, are great for clopping around outside during summer. 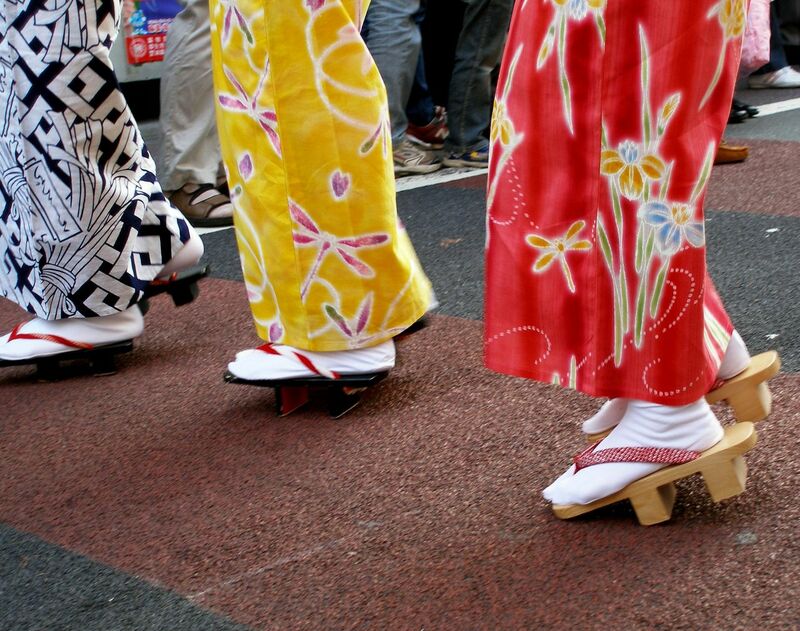 Although an old-fashioned shoe, geta are still a part of Japanese culture. Designers have from time to time reimagined them in more Western shapes; but for casual outdoor wear, the standard shape continues to be a practical and stylish option that can be worn almost any day. Zori, as explained below, probably win out in terms of pure comfort, but for head-turning footwear, nothing beats buying a pair of Japanese geta—just put on a pair and walk around town to see for yourself! Except for the workwear type, women’s zori are always raised in the heel. The sole is also gently rounded in shape, so that to Western eyes they look more like regular shoes than geta. Men’s zori, while also slightly rounded, are always flat. The most beautifully decorated women’s zori are worn with kimono at very formal occasions, with the sandals becoming less elaborate as events become less formal, right down to straw zori for working. Men’s zori have fewer levels of formality than those for women. They are often made of straw or wood and can be worn barefoot. For weddings, women’s zori are covered in ornate brocade fabric and accompany the most formal of kimono. For occasions that are less formal but still important, zori are covered in other types of fabrics. Another step down are vinyl zori, which can be really stylish but would not be worn to a formal event. Imitation straw zori (traditionally made of bulrushes) are also common but they are considered workwear and not worn with kimono. Within these distinctions there is a lot of room to be creative. For special occasions they may be made of lacquered wood, or feature painted designs, or fur trim. Regular plastic zori are also attractive in different colors and can be customized with accessories. Imitation straw zori worn by both men and women are always flat and never worn with a kimono. Although zori for men are most often this kind, there are also modern plastic versions that may be plain, lacquered or stained. When deciding if you want to buy Japanese zori, just imagine your most comfy pair of sandals made even better by authentic Japanese craftsmanship. Add to that the unique Japanese aesthetic, not likely to be found in a Western knock-offs, and you have footwear that friends will be jealous of. You will surely stand out as you strut your fashion, but of course you knew that already—when you are wearing zori, you’re definitely walking to the beat of your own drum! The final touch to traditional Japanese sandals are tabi, or toe socks. Except for the straw kind, women’s zori are always worn with tabi, but men only wear tabi on formal occasions. 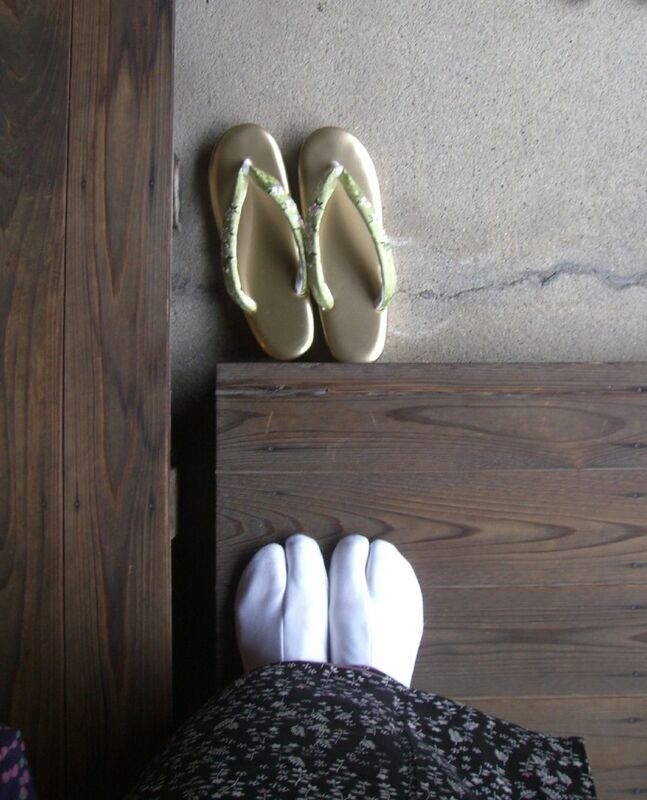 Tabi are not worn with geta when they accompany a casual cotton yukata. The general rule is that unless casual, all occasions require tabi. Before assuming that tabi are just socks with a big toe slit, there are a few things to know. Rather than knitted, they are sewn from cloth cut to shape. The foot is slipped in through a row of fasteners at the back, and the tabi buttoned up the ankle. They have a rubber sole, so that when you remove your shoes you can walk around on the spotlessly clean floors inside. Although for women they are predominantly white (and always white on formal occasions) patterned tabi are becoming popular for both men and women. Traditionally, men can wear blue or black tabi when traveling, but they wear white tabi on formal occasions. Japanese people tend to have slightly smaller feet than Westerners, but this doesn’t exclude you from getting a pair of Japanese sandals or tabi. Especially since zori and geta are worn slightly small anyway, the foot should hang over the back a little. There is a good reason for this, especially with geta, because proper placement of the “teath” under your feet is what prevents you from losing your balance. Check your Japanese shoe size here. Simply speaking, zori are formal sandals, while geta are casual. 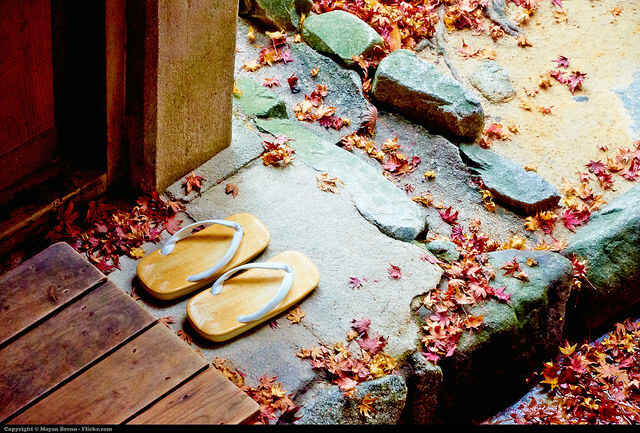 But whether it’s zori or geta, they have one big feature in common—they keep your feet nice and cool in hot summer weather. They are also designed for comfort and practicality, and those made in Japan have a special aesthetic that simply can’t be found anywhere else. 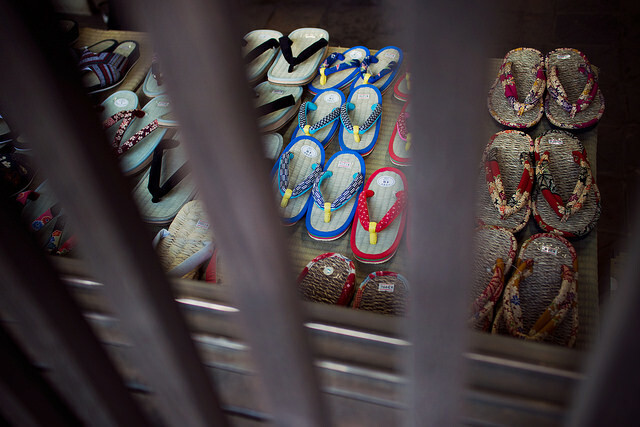 If want to put your foot down and buy a pair of traditional Japanese sandals. Thank you for your informations. No wonder when I tried on a pair of Zori that is the size of my foot it looks big. A little smaller and my heel just hang out a little over the edge do look better than the size that fits. Zori do look good for casual wear, it goes well with jeans and man’s cotton trousers.